So check out the new site and it’s slightly newer style. Update your bookmarks and let us know what you think! We always love to hear your feedback. This page will no longer be updated, but all of the content from here has been moved over there, so check it out! 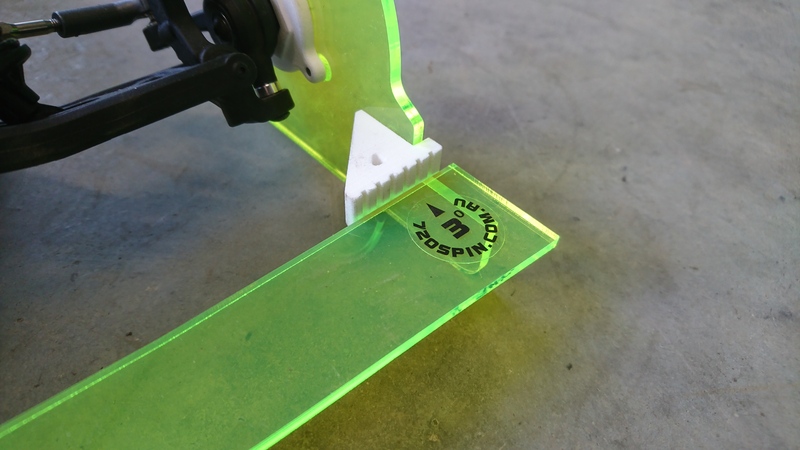 These setup tools allow you to quickly and easily adjust the toe and camber on a variety of 1:10 scale radio control vehicles. Also available is a set of camber gauges and a longer set of plates to suit Stadium Trucks and Short Course Trucks with their wider stance. 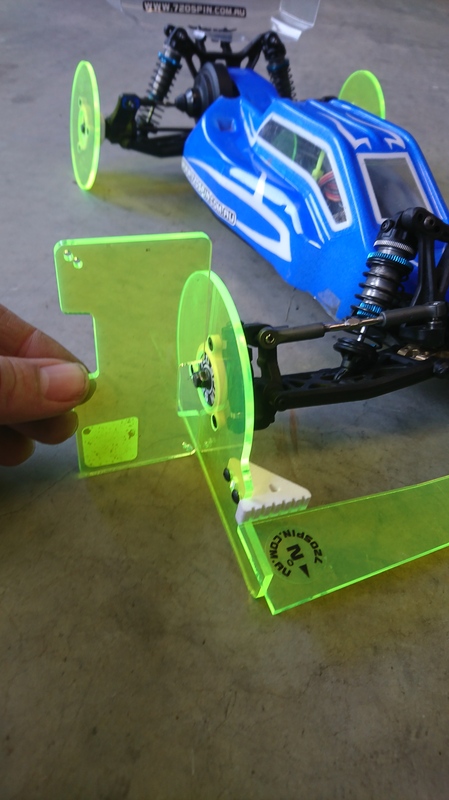 Available in 3 fluorescent colours there is an option to please most people, but not get lost in your pit bag. Those being Yellow, Pink and the Green set that is pictured in this review. Basically, the do the job very well at a fraction of the time and cost of a Huddy setup station. Yes you are only measuring Toe and Camber, however they are two of the most adjusted settings on most race cars. The camber gauges took me a minute to work out which corner was which angle on the three double sided gauges. Then I realised that 1 large hole was for 1 degree, 1 large 1 small for 1.5 degrees etc up to 3 degrees, and a square hole for 0 degrees. I have the Mini Camber Gauges on test at the moment which consist of 3 pieces, or there is the larger unit which is only 2 pieces, but is physically larger to store. The Toe and Camber sets look very professional, and fit very well to the vehicle. Measuring the camber is much simpler of these setup wheels than having tyres & wheels attached to the vehicle at the time. The toe measurement is as simple as selecting the degree measure noted on one one side of the three bars, and adjusting until the blocks sit flush with the measurement plate. 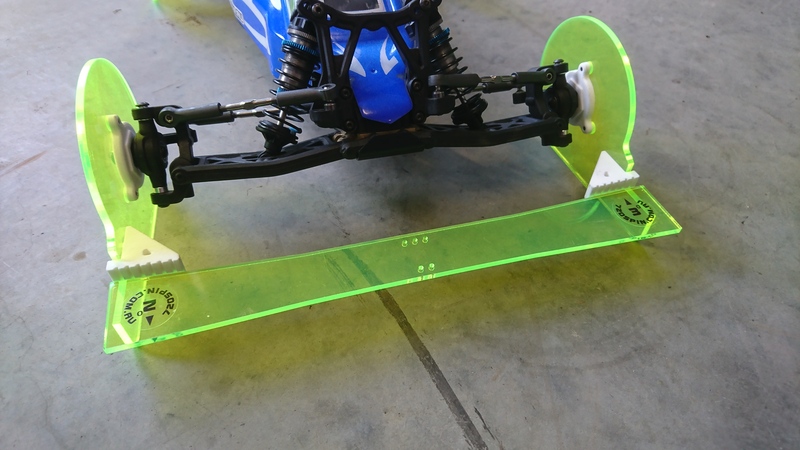 If you have a wider Short Course Truck or Stadium Truck, you can either purchase a wider set, or you can purchase the longer plates to go with the standard set you already have. We have both versions on test at the moment. Costs of the units vary from $15.95 for a set of Mini Camber Gauges, to $25.50 for a pair of camber setup wheels, or $56 for the Toe & Camber set. There is also a 4 piece Toe set available for $49.95 (prices correct at the time of publication). These are a great product, and about the only down side is that I found that I scratched them when sliding them across my garage floor. Yes, I should have been on a table so mostly my own fault, but they will scratch over time and use. However the trade off is a lower cost than a carbon fibre unit, as well as the ability to see through the parts themselves. If you are after some basic setup tools these are certainly worth looking into. The 2nd part of my review will come next week looking at how they work over a major race weekend, as well as how they go on my Short Course Truck and Stadium Truck. A huge thankyou needs to go out to the crew at 720 Spin in Melbourne for sending me these awesome products to test. We look forward to seeing what other innovative products they come up with. I love being able to promote new Australian RC companies, so it is always an exciting day when I find out about a new one. 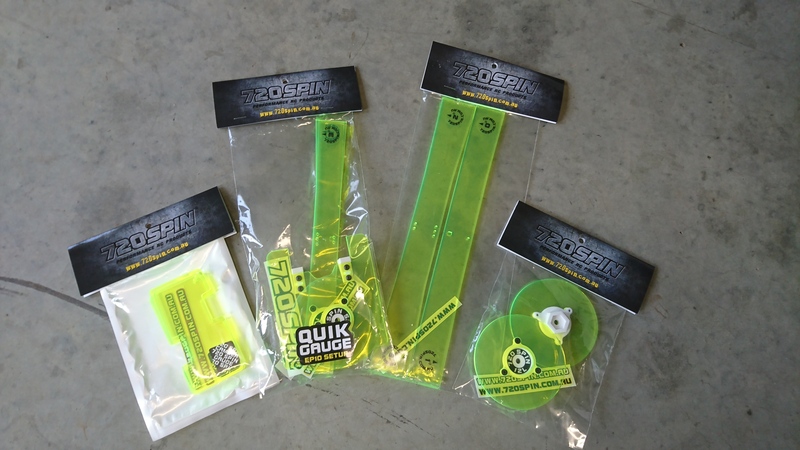 720 Spin is a very new company selling performance RC Products from their base in Victoria. 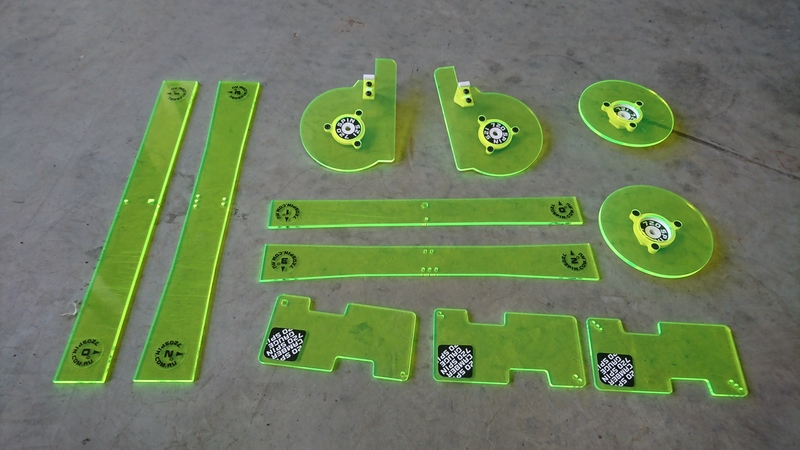 These products take the form of toe and camber wheels, camber gauges and more. Make sure you find them over on Facebook and give them a like as well as check out what products they have available on their website at http://www.720spin.com.au. 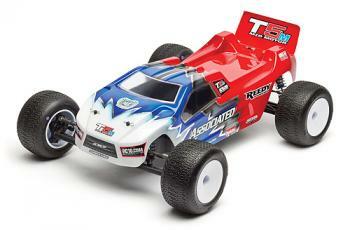 You will also find their products at Traction RC, as well as I am sure other stores in the near future. 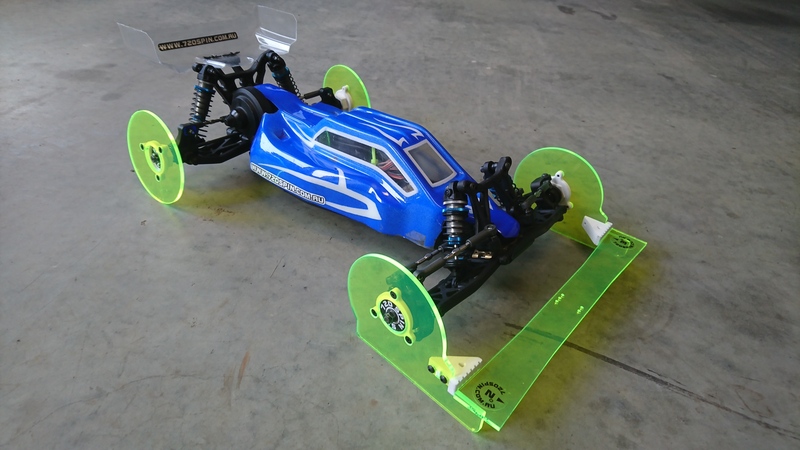 In other excited news, I have a set of these arriving for testing soon and I will be able to give them a good test run at the largest event of the year at my local club, the 2017 Launceston R/C Cup. So keep your eyes peeled for some first hand reports of what these are like. 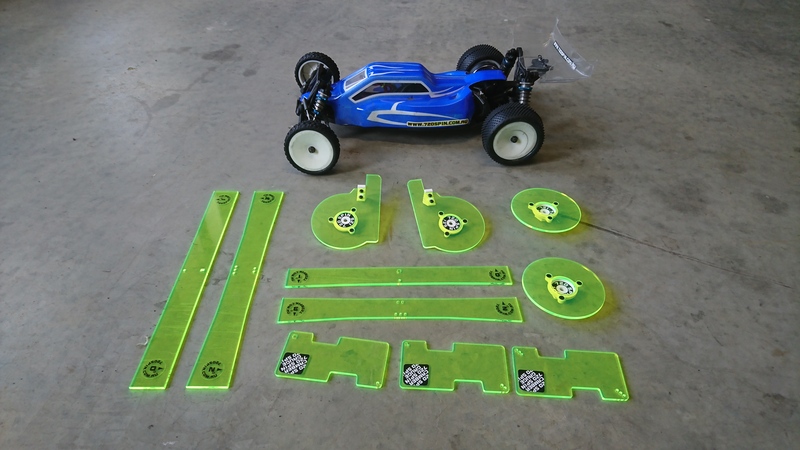 You may, or may not, remember some time ago that I purchased a Hobbywing Quickrun combo for my son’s buggy along with the matching 17.5 turn motor. Yup it was over a year ago I am sorry to admit. Why so long to review this, well that is somewhat of an embarrassing story. At the time I purchased myself a new buggy, and moved my electronics into that, and set up my old buggy for my then 8 year old (now 10 year old) son. I got it all together and ready for the next race meet at my local track. My son was super excited ad ready to rock. We got to the track, and that is when it happened. Yes I plugged the battery in, turned the car on and the smoke came out! Yes I had plugged the leads into the battery backwards proving it can happen to anybody! In my defence, I have one battery pack where the terminals are on opposite sides. However that is no excuse for being lazy. So no EVERY battery pack I have has the positive side tube painted RED with Humbrol red paint from my local hobby store so I can’t make the mistake as easily ever again! The 17.5 turn motor however I can briefly talk about as now this is basically a long term review. So as I mentioned, this car is in the hands of an 8 year old boy most Friday race nights, and whilst he is improving (and has just turned 10), he is not the most sympathetic towards his vehicle. BUT, this motor is still kicking on strong. It provides great torque and power for a very low cost proving the worth of these budget items from Hobbywing. Really it is an amazing unit for the price. Whilst the track conditions it is used in are not dusty due to racing indoors on carpet, the surface being concrete is not gentle on cars, and nor is Novice/Junior racing. Yet it hasn’t missed a beat, not even the sensor cable coming loose. Well I would have to say on what i experienced of the ESC before I killed it, and what I have seen of the ESC in other people’s cars, I would have to say that I am certainly converted to Hobbywing and would not hesitate to recommend this combo to anybody getting into the sport. Whilst I have been looking for a ESC/Motor manufacturer to use since the departure of Novak from the scene, I think I can safely say that Hobbywing will be filling that place for future purchases. The AARCMCC executive is trying to get together a more balanced calendar of events for 2018, which i can say from the perspective of trying to arrange non clashing dates for a major event, is very, very welcome! In an effort to align, publish and plan next years calendar, we are now seeking expressions of interest for AARCMCC Sanctioned Events for the 2018 calendar year. This includes all events as defined within the various section technical regulations, including, but not limited to National and State Championships. We ask that you nominate the event(s) you would seek to host next year, including two dates – one that aligns to any preliminary or example calendar within the relevant technical regulations and a second date of your choice. If you plan to apply for two or more events, for example BOTH a state and national championship, you will need to submit this form twice. Cut-off for expressions of interest will be 15 October 2017, and you will be asked to reconfirm any event EOI that you may submit with your re-affiliation by 1 November 2017. To be guaranteed to be considered to host an event next year you MUST submit via this process. Any event that does not receive an EOI is not guaranteed to run next year. R.I.P team Durango, long live the King! With the apparent death of Team Durango (although technically unconfirmed), it seemed fit for me to look for a new team to power me into coming years. Now that home has come a little earlier than I expected, but he when opportunity knocks grab it. I was fortunate that a mate had a Team Associated B5M for sale 2nd hand. After looking at who offered the vehicle classes I was interested, prices and so on, Team Associated seemed to be the way to go. Looking into the support offered by Team Associated Australia the choice was a clear one so #WeAreAE and soon I will have a B5m to review, so watch this space.